I believe we are one of the oldest boat building yards in the world to be run by the family as a majority. Our history has been told many times in these last fifty years, but, to understand it, you need to grasp our company values, and return to its origins, since it is nothing but continuity and progression. The fate of Benjamin would be out of the ordinary. Born in St-Gilles into a large family with little means, he was adopted at the age of 6 by one of his uncles, François Houyère. A single man, he passed on his love of the sea, adventure and boats to his adoptive son. However, at the age of 12, Benjamin became ship’s boy on the lugger Eliza. His dream of building boats would begin on the boatyard of his best friend’s father. His determination would convince his uncle, and he would enter Rochefort towards end 1879 for his military service. It’s near the bridge, on Quai des Greniers, that our grandfather created his boatyard in 1884, on which, of course, figured his name: BÉNÉTEAU. At the time, boats were called luggers, dundees, and smacks, all with sails of course, but for these fishing boats, performance was judged by who got back to harbour first, since the first there would sell his fish at the best price. For this reason and many others afterwards, this search for performance would remain central to architects and builders, leading them to surpass themselves; never satisfied, and constantly innovating. In 1909, the approach of the engine had sounded and, whatever the cost and consequences, he would design the first engine-powered fishing boat in the region. He found no customers. Nonetheless, he became the boat’s owner. Agitator, he would call it Vainqueur des Jaloux (Conqueror of the Jealous). At the time, Croix-de-Vie, a large sardine fishing port, had ten or so sardine canning factories. The women believed that the engine’s noise would “frighten off the fish”, so they stopped work and waited for Benjamin with stones in hand. The mounted police were then brought in from Les Sables d’Olonne and La Rochesur-Yon. Lasting several months, this dispute came to an end of course, and our grandfather would call the second enginepowered sardine fishing boat he built "La Paix" (Peace). Then the Great War intervened. The boatyard would get underway again in 1928, orphaned of his mother and father, and the time had come for André Bénéteau, only son of Benjamin, then aged 21, to take over. Benjamin’s absence was experienced by the inhabitants of St-Gilles-Croix-de-Vie as the end of the Boatyard. Admittedly, our father 1probably did not have his force of character, being rather “taciturn”, as was often said of one of our greatest sailors, but father had the gift of drawing. A fisherman had faith in him, and under the shed, he would draw and build his first fishing boat. I personally recorded this account from the old folks, when I was very young. They explained that on the day the boat was launched, the people gathered, as was customary, to participate in the event, and were stunned by the elegance of this fishing boat. The BENETEAU Boatyard was back in business! Then the Second World War came, together with the departure of a few companions. Father married our mother Georgina, and our brother André was born in 1934. At the end of the war, with the return of some of the companions there from the start, the Boatyard would be back in full swing again for an exceptional period that would last until the 1960s. My brothers and sisters and I have wonderful memories of this period. Admittedly, our family was modest and cost prices did not fill my father with passion, but what a school of life it was! Everything began for us with choosing oak trees in the forest on Sunday. This got us outdoors, but choosing trees was an almost religious moment, as was their arrival on Quai des Greniers, and their cutting, with the stress of finding too much sapwood, in which case, we had to start over again. We all lived together as a family: children, apprentices, employees, customers and I do not know a finer trade than that of a boat-builder during that particular period. Of course, this was how we learned all about it. I cannot pass over my mother’s role, in this page of our history, in silence. Although our father was considered an artist, and respected as such, our mother was “the Boss”. Those with difficulties towards the end of the month came to her, as did the workmen who injured themselves, and my mother dressed their wounds. She knew everything, and most of all, she faced up to everything. If you learn by good example, we could not have dreamed of a better mother than this small – one meter fifty – yet so great a woman. I can only remember impressions of this time. All the noises dimmed, our workmen did not whistle as often, our parents kept silent, customer visits became rare and the bankman’s visits more frequent.We were experiencing the start of the end of this fine building trade, with the decline of the fishing trade. The passion of André, our elder brother, is drawing. Unfortunately, there was nothing left to draw. Our parents still had three children to raise, and we had our 17 ship’s carpenter companions. How do you find new jobs for ship’s carpenters ? Many said we were lucky. Personally, I see the mark of fate. It was when I met the man who would later become my husband that I realized what was wrong and understood what went unsaid, as well as the gravity of the situation. I was not yet 22 and I was a woman in the 1960s. ‘Business women’ were rare occurrences, earning little recognition, even though, in traditional tradesmen’s circles, the wife was often the boss. We also owe this luck to our father, who without thinking of ‘sailing’ for a second, had knowledge of a new material: polyester. Our father’s idea was to make dinghies for sardine fishing boats out of polyester, which, together with my brother André, they did in 1963. So it was by visiting maritime cooperatives to sell our dinghies to fishermen, and by showing them at the Lorient Biennial, that we would be noticed by the future dealers we would advise. The 3.60 m sardine fishing dinghy became the Guppy, the 4.30 m one the Flétan, and the small 5.80 m tulip-shaped speedboat, the last boat designed by our father, the Ombrine. In fact, we had just created a new market segment, which would be referred to as the recreational fishing boat, but we did not yet know this. I must pay tribute to my husband, Louis- Claude, who was already a company director in Challans, because not only did he encourage me but he promised to help me, which he did until he passed away, without ever making a decision in my stead. Louis-Claude was a builder. We had great pleasure and complicity in developing BENETEAU, and without this meeting, I would not be writing these lines today. I must also pay homage to my brother André. There were 8 years between us. We were the two eldest of the family and we very quickly understood that we were, in fact, complementary. Each took up his own position and, all through our lives, the love of the family business was the best shield against the endless selfish fights that often set a family at loggerheads. January 1965: our first Paris boat show. For André, his wife Mimie, and myself, it was highly stressful. No other boat looked like ours and, not used to the capital, we felt like we did not belong. Yet, only a few hours after the opening, three business men introduced themselves, claiming that our boats were what their customers were looking for and that no other builder wanted to build them. One of them asked for Morbihan, the other Finistère, and the third the Côtes du Nord (now Côtes d’Armor). In all, their orders represented several months of work for our teams. After two minutes discussing distribution with my husband, the choice was made. We would distribute our boats through this network, which except for Jeanneau, no one else did. During these seven years, we would balance out our accounts; subsidize the end of fishing, while we found new jobs for our ship’s carpenters one by one. We would also listen to our customers and invest only in new products, following their desire to buy slightly bigger boats. This is how, alongside the Guppy, the Flétan, Capelan, Cabochard, Galion, Forban, Kerlouan, Baroudeur and Ombrine were born: a full range from 3.60 m to 5.80 m, in a typically national segment at the time. My brother André was at his drawing table, our father supervised the prototypes in particular, the young ones grew up and the family was happy again! 1972 would be a great year! With financial stability just about recovered, we were going to invest, first in the workforce, but also in our first plant, which was modest but really designed with semi-industrial production in mind. We wanted to develop the recreational fishing boat. Our customers had learned to sail and they wanted larger boats, comfort on board, and to see the sea from the saloon.There is nothing harder than beginning a new range. My brother André listened to us and I can still see him, after months of thought, when we were visiting a boat show in Germany, drawing an innovative boat on a paper napkin in the restaurant and saying “there’s your boat!” This would be the Evasion 32, followed by the later Evasion 37 and Evasion 28 versions. We then built a new plant in Commequiers, especially designed to manufacture what we thought, at the time, to be the largest production boat sizes that the sailing market would require. At the same time, for the motorboats, the Ombrine would give birth to the Antares range, always designed by André, whose great passion was line fishing. On the family side of things, we would also see our younger brother Yvon enter the company. He would be fascinated by production all his life and become one of our best specialists. Back then, we had a considerable market share in the recreational fishing boat segment; thousands of customers sailed them, but some of them left us because they wanted to sail faster. François, a great regatta racer, dreamed of creating a high-performing sailing yacht. André wanted to draw it, but we knew that in this area there were architects with different experience. How do you bring someone to understand that, for the first time, a BENETEAU boat could be drawn by an architect from outside? Luck was with us. We were offered the moulds of L’impensable, the boat designed to win the Half Ton Cup and which kept its promise. We would redesign the sail plan, keel, interior layout, and shape of the coachroof with André Mauric, and it would be called the First. Nobody was expecting this. We showed the First at the Paris Boat Show and it was a revelation. It would become a legendary class. This was the boat that would really open the way for export. This fantastic success brought us to build several new production plants, all designed by the Béri design office, founded and managed by my husband and which would later become our family Holding. The yard’s motorboating team entrusted Cees Van Der Velden 2 with perfecting a catamaran with which he won the “PARIS 6 hours” flying BENETEAU colours. I can still see the faces of our builder colleagues and friends at the time. How could we, inexperienced ‘sailors’, win this race with a motorboat ? This was not a problem, close on its heels the Flyer range was born and the first models were shown at the Paris Boat Show. In yachting, it was the great Admiral’s Cup period and, among others, with our wonderful partner Corum, managed by Jean-René Banwart, we tried out new hulls and identified the best architects in the world. There would be the First Evolution, Lady B, and First Lady, all prototypes that would help us progress and later enable us to provide our customers with the best production boats. During this decade, for all that, we continued to pay particular attention to our customers who wanted to take things further and we organized gatherings (I got the idea from the motorbike world). They were called the Évasions d’Or. We also thought about our future customers. We made agreements with radio stations such as Europe 1 and RTL. We joined them in the organization of the “tournées des plages” (beach tours) and it was in the delightful company of celebrities such as Michel Drucker, Carlos, Thierry Le Luron and many others, that the French discovered the joys of setting out to sea. This decade would be decisive. Of course, from the 1970s, we were investing in export insofar as our resources would permit, setting up a network of dealers and importers, in particular in European countries, with the exception of the United States, where we opened a subsidiary in Annapolis, in 1976. The aim of this was to establish our brand, but especially to understand the American consumer’s tastes by being present on site. During these five years, we would open subsidiaries, continue product development, take an interest in burgeoning charter companies, and in particular, the largest in the world: Moorings, then owned by an amazing couple - Ginnie and Charly Carry – who would become great friends, and with whom we designed the first boats that were really thought out with chartering in mind. This is how the 13.50 metre Idylle came to be. In a way it would be the ancestor of the Oceanis range. 1982 would also be the year a class was launched, its version established on the basis of one-design rules. The First Class 8, designed by Jean-Marie Finot, became the first French one-design class, with nearly 1,000 boats competing on seas for more than twenty years. Then would follow the First Class 10 and 12, which, at the time, would take part in the well-known “combat des chefs”(leaders’ fight) in Marseille; a challenge in which we would have the pleasure of seeing politicians and important upcoming company managers compete. 1984. The French Stock Market opened the Second Market. Zodiac was the first to be introduced and, for Beneteau’s hundredth anniversary, we would also be listed on the stock market. Considering the many investment projects we had in mind, we had to consolidate our financial organization. There is no need to say that it was a great moment in our history and, considering the new constraints this would entail, we equipped ourselves with our first Financial Manager. In 1985, apart from the new factory in Challans, we would begin to build our first production site abroad, having acquired sufficient sales volumes in the United States. It would be located in the centre of the east coast. The Carolinas appealed to us, and just two hours’ drive from Charleston we would stop in a small American town called Marion. For the French, to invest in the United States industrially was thought of as highly ambitious. Many groups had had to give up on such ventures, but our conviction was such that we did not hesitate a second. The basis for reflection on a Cruiser would be the Idylle, perfected by our friends Moorings. François Chalain would choose Philippe Briand 3 and, in a few months, they would create the Oceanis 350 and then the 430. The wager paid off, and success was instant. The production lines would fill up again. How could we revive it? We needed help! When François was dining one evening at Costes café with Odile, his wife, feeling good in these surroundings, he thought of Philippe Starck. I met Starck in Paris and he did not hide the fact that boats were not his speciality. So he suggested we leave him a 35 foot boat in his garden at Montfort-l’Amaury, saying that he would be happy to spend a few nights on board and that only after this experience, in all probability, would he be able to answer us. Although his approach was unusual, we met his request with a First 35, the first boat designed with two rear cabins, fruit of the collaboration between François Chalain and Jean Berret. And so we waited… The least I can say is that, when he reported back it, was a breath of fresh air !1! It was in this happy, affectionate and yet oh so professional atmosphere that the First 35 S 5 would be born. I could write pages of anecdotes and emotions related to this period which brought back joie de vivre and a desire to surpass ourselves, the greatest moment of which was when it was shown to the public at the Paris Boat Show in 1987. What a shock! One out of two customers adored it; one customer out of two hated it. This was not a problem, the production was a success and Starck not only helped us progress, but the whole profession. He also discovered a world in which he is now the designer of one of the greatest yachts on this earth! Always mindful of promoting sailing, this would be the year of the first Figaro Class. 1The Figaro race - formerly the Course de l’Aurore – traditionally raced on prototypes was to convert to one-designs. We could not be absent from this race, which we had been following since the First was marketed, a race which Michel Malinovsky won the day the boat was produced, bringing it such a great reputation. The project presented by BENETEAU and Jean-Marie Finot would win the competition. We would thus have the privilege of building these one-designs, but also of participating with the Figaro in the birth of a wonderful incubator of young sailors, who would then move on to offshore sailing, securing the reputation of French sailors in competition sailing. As the first world economic crisis to hit the sailing industry was looming, we continued our creative research on the First. A meeting at the Paris Boat Show with a loyal Italian customer would draw our attention. This customer, a great designer with Pininfarina, told us he “could no longer dream” since all boats looked alike. He talked of shapes that had changed, particularly in the car industry, and found our decks too angular. I must say that the Pininfarina family was wonderful. Sergio knew full well that our resources were comparable to those of his car industry clients, but he would make his services available to us and together our teams would create flexible decks. Once again, I was there for one of those virtually religious moments when, bit by bit, Mr Ramacciotti’s red tape transformed the deck matrix of the future First 45. The talent of designers will always fascinate me. This boat would be presold in large numbers, before even being shown, and I admit to still having the same feeling today when I see one moored at harbour. I am probably no longer objective, but they haven’t aged a bit. Before closing the decade of the 1980s, I would like to digress on fishing. We could not abandon our professional fishermen as customers, and gradually they progressed from wood to polyester. In order to separate our activities, we bought out one of the last wood boat builders in Vendée, the Gendron yard in Noirmoutier. Here we found a top quality workforce and, of course, fishing was our elder brother’s real passion. He would continue to develop hulls up to 22 m, and we would continue to mix with this very brotherly and friendly world of sailors, until the day we had to admit that it was no longer reasonable from an economic point of view. In 1991, in the context of a general economic crisis, competitors all over the world found themselves on equal terms. How do you manage a crisis when you have no markers? Some would manage it mathematically, but leaving their companies leaderless, some would manage things on a more human scale, braving criticism and scepticism, others would not cope at all. We succeeded in surmounting this ordeal, since we stood together. We trusted our staff and knowing their common sense, we knew we could count on them. No matter how difficult these phases, they are a time for questioning, raising awareness, and reorganization. It was during this period, that the people who had continued to forge the soul of Beneteau would leave us. We lost our mother, Madame Bénéteau and I lost my husband, Louis-Claude Roux, who, in a few seconds, would leave me alone with our two children and the Roux hardware business together with its two hundred distraught employees. Then it would be the turn of our brother André, followed by our loyal and talented François Chalain and his wife. I cannot write this account of the life of a family business, without paying them all homage one last time. In 1992, we carried out our first external growth transaction. Apart from the development of marinas and their facilities and an unquestionable tourist boom in the French Overseas territories, various tax relief laws enabled the creation of small new yards in France. This was how CNB was created in Bordeaux. In 1994, O’Hara was our first diversification. This idea was not mine and it was visionary. We would implement it with some loyal friends from the company and it would be called O’Hara. Our motivation was to diversify to soften the successive social shocks due to market downturns in the sailing industry. In fact, inspired by the old south in America, we would create a small mobile home which would revolutionize the world of camping. Later, our Vendée rival, IRM, joined us and we would manufacture up to 14,000 houses a year. In 1995, Jeanneau was our second area of external growth. A chance to make peace with our long-time great challenger would be the high point in our history and probably that of the French sailing industry too. It would be a tough fight. The administrative services in Paris had decided to restructure the sailing industry. In this restructuring, “they” defined our future, but what right was it of theirs? I became aware of this after a loyal friend confided in me at the Paris Boat Show, but it was nearly too late. I was completely outraged ! I immediately returned to Vendée, isolated myself to think things through better and, once again, I called my faithful solicitor. Their maneuvers were sufficiently crude to enable us to attack. So we attacked. The tribunal gave us an extra week to hand in our offer. In short, the hearing arrived and, in their wisdom, the Court of La Roche-sur-Yon preferred our project. I was shattered when I finally went home and I only remember the smiling faces of my two children, deprived of their mother once again during these Christmas festivities and who, thanks to their loyal nanny, Joselyne, were happily waiting for me with a bunch of roses. These two days over, this union meant a lot to me. It was the coming together of two Vendée families and two companies faced with the same problems and which immediately spoke the same language. They were two teams who, the day before, felt they were each better than the other. They would discover that they each had their pros and cons. So we would decide to focus on each team’s pros and leave the cons to the side. Together, we experienced the very strong market recovery and together, enriched by the contribution of new and experienced men, we changed scale. It was during the crisis that the scale of the business developed. BENETEAU Boatyard became BENETEAU Group. Then came the question of where we would locate our headquarters. It would be at St-Gilles-Croix-de-Vie, facing the harbor entrance, when we bought the restaurant, Les Embruns. It was the place where so much of our business had been done and where, facing the piers, our father took us as children to witness the launch of his last trawler, not hesitating to criticize his own work, before leading us off to his office, where he would change his plan for the next boat. 2004.Everything was going well. Our development was spectacular. We were building new factories and renovating the existing production plants with the Béri design office under the leadership of Yvon Bénéteau. We were increasing our market share, but we were no longer a small family-run company. As for me, forty years had flown by, life had taught me much about the problems connected with succession and my responsibility would be to anticipate the future, particularly in this area. This brought me to initiate and oh so important yet difficult phase. This would be to set up a real governing body for the Group to ensure its continuity in the future, beyond the fate of men. It is our duty towards our employees, customers, and suppliers, as well as non-family member shareholders who have put their faith in us. This governing body would be comprised of a Board of Directors, mostly family members, as well as a Managing Director, up until now, from the family. We would adopt a method of governance comprised of a Supervisory Board – extended to people outside and skilled in very specific areas – as well as an operational board of directors. 2008, group BENETEAU incorporates the Italian company Monte Carlo Yachts and appoints Carla Demaria at its chair. Monte Carlo Yachts must completely renew the perception of luxury in yachting by focussing on its basic features: timelessness, intrinsic quality, the value of standing apart. On 23 July 2010, 18 months after this new boatyard is officially created, the first MCY is shown to the international press for the first time, in Venice. The elegant 23 m flybridge yacht is authentic, innovative and noble. It reinstates strong values. Apart from the boat, an important new brand of the Beneteau Group emerges from the shadows on that day. 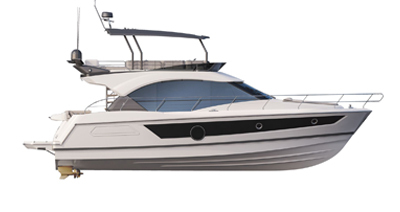 Beneteau conducted a new external growth operation in 2014. In 2014, as part of the Group’s development strategy in the Motorboat market in North America, Beneteau acquires Rec Boat Holding LLC, holding four prominent brands : Four Winns, Glastron, Wellcraft and Scarab. I shall end here by expressing my recognition and that of my family to all the executives I was unable to refer to, present or not, and to our loyal and talented employees, as well as dealers and customers throughout the world, all of whom have become friends, whether they are from BENETEAU, Jeanneau, Prestige, CNB, Lagoon, O’Hara, I.R.M, BH and, now, Four Winns, Glastron, Wellcraft, Scarab & Monte Carlo Yacht.